Foley Gallery is pleased to present “Blind Prom,” an exhibition of documentary photography and formal portraiture by photographer Sarah Wilson. Sarah Wilson was introduced to the blind community in 2005 when she began working as a stills photographer and field producer on the PBS-funded film, The Eyes of Me, a documentary about four students attending the Texas School for the Blind in Austin, Texas. Springing from her immersion into this film’s new company, Wilson’s own series, “Blind Prom,” focuses on an American right of passage, the high school prom. Throughout the night she captures candid moments of the prom attendees, while producing their formal portraits. These rich, full-color images express the joy and spirit of, the thrill and intensity for a group of marginalized teens participating in the universal experience of attending a formal prom. Over the last three years Wilson has become close to many of the students at TSBVI, and their experiences have challenged her ideas about what it means to have a disability. She believes that these images from prom night have a universal appeal, and could become a medium for consideration and understanding of what life might be like as a blind teenager. With this project she hopes to challenge the preconceptions of others, focus on the connecting points between diverse communities within the American landscape and through portraiture, reveal our shared humanity. Sarah Wilson received her degree in photography from New York University. 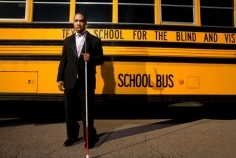 She was awarded the 2008 PhotoNOLA Review Prize from The New Orleans Photo Alliance for “Blind Prom”. Her most celebrated project to date, “Jasper, Texas: The Road To Redemption,” earned a Photo District News Photo Annual Award, and selected prints from the series have been included in the permanent collections of the Harry Ransom Center at the University of Texas, and the Museum of Fine Arts Houston. She travels abroad on editorial assignments for Texas Monthly, EuroMan Magazine, Mother Jones, the London Sunday Times Magazine, and CNN. Her personal projects have been published in Texas Monthly, and exhibited at galleries nationwide, including the White Box Gallery in New York City. Wilson currently lives in Austin, Texas. Foley Gallery is pleased to present “Beauty Pageants,” an exhibition of documentary photography and portraiture by photographer Colby Katz. While many children spend their Saturdays and Sundays indulging freely in games of tag and make believe, a few are on the road, marched and marching tall into a cutthroat industry of adorable. For the last five years, photographer Colby Katz has been documenting the behind the scenes of child beauty pageants. Her long focus on this project comes as Katz herself was entered into pageants as a young girl. As a fine art and documentary photographer Katz has often thrown her spotlight on subcultures, from the oddities of sideshow performers and blitzing of the paparazzi, to the blind liberty of nudists and quirk of small town beauty pageants. Subcultures we may gape and marvel at from afar yet rarely are allowed to survey from within. Katz’s “Beauty Pageants” series permits us an insider’s view, inside hotel rooms, elevators and hallways where teeny-tot contestants are being fussed and fawned over, preened and perfected, hair-sprayed and spray-tanned by a swarm of proud, ambitious mothers. Pictured above, Rayne-Lin, “Little Miss Firecracker, LA,” hooks a tiny arm around the column of her towering pageant trophy. The golden accolade stands nearly twice the tike’s height. Katz will often frame some sort of exaggerated disproportion or incongruity, as between mother and child’s body, between their age, and purity. Colby Katz was born in Washington, D.C. and raised in Florida. In 1998 she received her BFA from New York University’s Tisch School of the Arts. Her work has appeared in books, magazines and has been internationally exhibited at such spaces as The National Portrait Gallery in London, FOAM Fotografiemuseum in Amsterdam, and The Lennox Contemporary in Toronto. In 2004, she participated in the World Press Photo Joop Swart Masterclass. Colby was selected by Photo District News as an Emerging Photographer in 2005, and in 2006, the Magenta Foundation also awarded her this title. Colby currently lives in Fort Lauderdale, Florida.